King County residents are familiar with casting their ballots by using one of many drop boxes located around Western Washington. But what about the same approach for getting rid of old, unused medications? 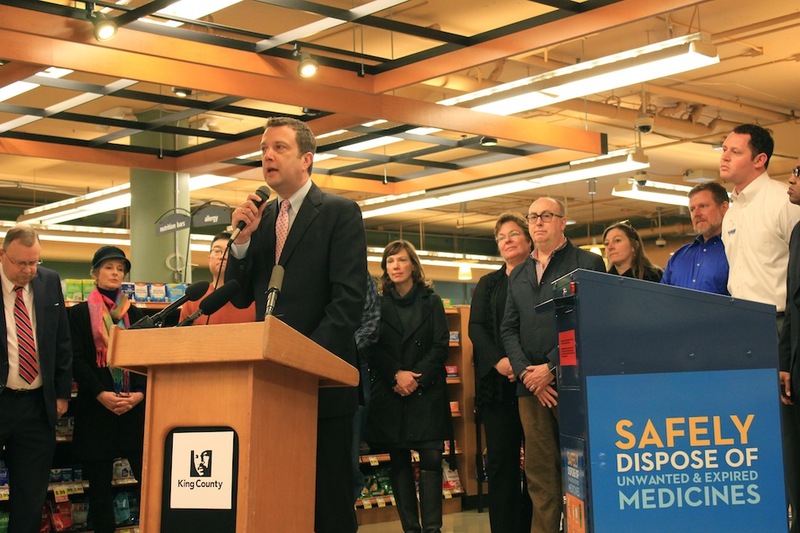 Last week, the county hosted an event at the Broadway Market QFC in Capitol Hill to discuss the launch of its new secure medicine return program. King County residents can take their unused and expired medications to participating pharmacies and law enforcement offices to dispose of them at no cost. For those with limited mobility, mail-back services are available. “Most adults and teens who misuse prescription medicines aren’t getting them from drug dealers, but from a friend or relative’s medicine cabinet,” said Dr. Jeff Duchin of Public Health-Seattle & King County. The program comes after several years of work, and a legal battle. Kenmore Mayor David Baker originally brought the idea to the King County Board of Health. King County Councilmember Joe McDermott — who chaired the board at the time — said the biggest hurdle was the opposition from the pharmaceutical industry. Once the board adopted the program, the industry filed suit against both King County and Alameda County, California, which had adopted its own safe drug disposal effort. In 2014, a panel of judges from the Ninth Circuit Court of Appeals found the California ordinance was not unconstitutional, and the following year, the U.S. Supreme Court declined a petition to hear the case. “It was a long, hard fought battle,” Baker said. Baker, who is serving his fourth term as mayor, said there are more than $1.2 billion per year in prescriptions written in King County. The cost of disposal for producers of those drugs, he said, is less than two cents per prescription. “I think that’s a very small price to pay to protect our water supply for future generations,” he said. McDermott said Washington State has led the efforts to address the prescription drug overdose and misuse epidemic, and the return program is the “next logical step.” Baker also framed it as an environmental issue, noting the problems that unused medications can pose to the environment if they aren’t disposed of properly. Over the last number of years, McDermott told the Queen Anne & Magnolia News, the DEA has run quarterly drug disposal events that have shown the demand for a full-time program like this. With that in mind, McDermott said there isn’t a certain rate of returns that he hopes to meet. 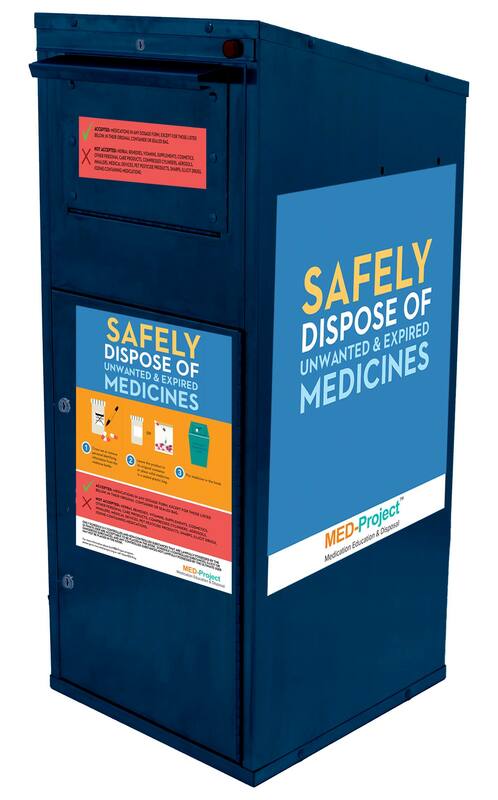 In all, there are currently 99 drop-boxes installed and operational, and more than 400 drug producers who are participating in the program, which is overseen by Public Health-Seattle & King County, and the Local Hazardous Waste Management Program in King County. Baker said the goal is to have one drop box in every city, and in big cities, one more for every 30,000 people. For more information on the program, or to see a full list of drop box locations, go to www.kingcountysecuremedicinereturn.org. The nearest location for Queen Anne and Magnolia residents is the QFC at 500 Mercer St.